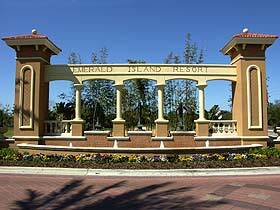 One of the best entrances into any of the gated communities in kissimmee. This is enhanced with dolphin fountains. This is a sort of permanent billboard that paves the way to your home. After making the left turn (marker 5), from US192 highway, at the traffic lights you will pass on your right, the shopping centre that caters for most of the vacationers and residents in the area. You will find an array of restaurants, services and shops, including Goodings grocery store, with wonderful Chinese architecture. Here you will find Outback Steak House, Sushi Japanese Restaurant, Cracker Barrel, TGI Fridays or, for a quick snack, Subway and Dairy Queen. There is also a tourist information centre. On the other side of the road is the very popular Red Lobster, for which you would probably need to book in advance. Upon arriving at the first set of stop signs turn right onto Funie Stead Road. A short distance further along on your left is the dolphin entrance to Emerald Island Resort.